Today, Expo Chicago returns to its home on the Navy Pier overlooking Lake Michigan. This is the sixth edition of the city’s annual art fair and exhibition platform, which is the biggest of its kind in the Midwest. The center of the fair lies in the convention center, where 135 galleries, non-profit organizations, and arts publications from 25 countries around the world have set up booths, ready to start selling. It’s a surprisingly spacious affair, at least compared to other major events. In fact, on the whole, the product is more thoughtful than the typical art fair offerings. From individual booths, to large-scale projects (some of which span the entire city), this year’s Expo is marked by attentive curation and sincere Chicago love. On the fair floor, several booths stand out amongst the others. Hometown galleries Rhona Hoffman and Kavi Gupta set the bar high with strong showings, especially with the work of Jessica Stockholder, Deana Lawson, and Jackie Saccoccio. San Francisco-based gallerist Jessica Silverman’s collection of works by up-and-coming artists such as Matthew Angelo Harrison, Hayal Pozanti, and Julian Hoeber was a highlight, as was Salon 94’s presentation of photo works by David Benjamin Sherry, Lyle Ashton Harris, and Jimmy DeSana. One of the strongest—and most unconventional—booths, presented by Galerie Gmurzynska, features individual viewing rooms based off of Renaissance-era luxury art displays. In them you can find rare works by Lazlo Maholy-Nagy, Yves Klein, and Fernand Leger. On the outside of the booth the gallery had printed old images of some of their artists working in Chicago, such as pictures of Christo and Jeanne Claude wrapping the Museum of Contemporary Art Chicago in Ribbon in 1968. The booth from New York gallerist Catinca Tabacaru spotlights a new collaborative project from artist Rachel Monosov and Admire Kamudzengerere titled 1972. Equal parts performance and photography, for this work the duo spent a month enacting an imaginary marriage between a white Jewish woman and a black African man in an era where such a partnership was unthinkable. As part of the project, Monosov and Kamudzengerere actually married each other (in a real ceremony), built a house, and lived together, documenting the whole thing in beautiful black-and-white photos. 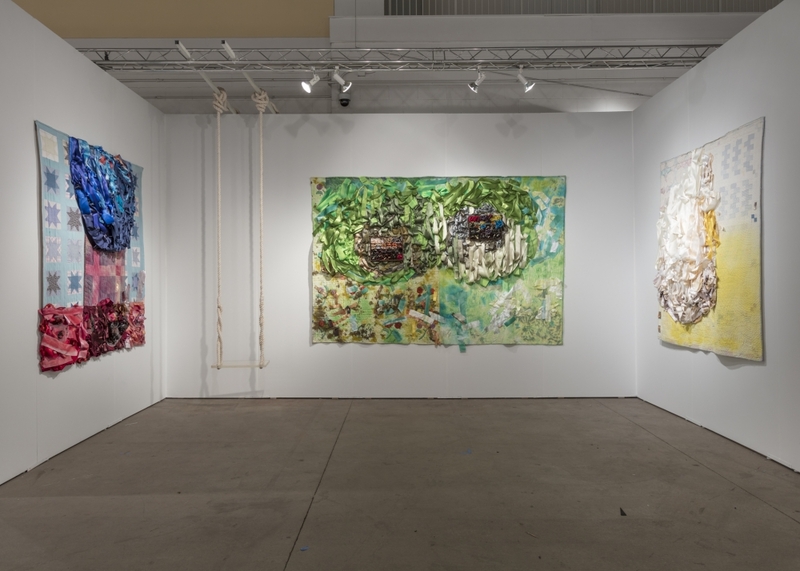 At the Geary Contemporary booth, a simple swing hangs from the rafters by plain cloth strands. The work, created by artist Vadis Turner, features an acrylic base covered—literally—in the sweat and tears of ovulating women. The MSU Broad, one of the few museums at this year’s fair, tease their forthcoming November show that will bring together two of Michigan’s most famous artists, Jim Shaw and Mike Kelley. At their booth, the Parisian art collective Bells Angels runs a screen-printing shop, making limited edition posters featuring images from Jim Shaw’s rare book, The Hidden World. Posters can be purchased for $50 each, and all proceeds support the show. Another non-profit, the National Resources Defense Council (NRDC), partnered with the Chicago art duo Luftwerk to present an environmentally themed installation. Triangular pieces of mirror are mounted just above the booth’s floor, floating like pieces of ice on water, reflecting the light from above. Meanwhile, compressed recordings of an Antarctic ice shelf are played through speakers, like slow, foreboding sirens. The list of things to see is hardly contained to the cubicles on the convention center floor, though. A steady stream of dialogues, featuring names like Nina Beier, Thomas Demand, and Flavin Judd among others, is being held throughout the week. Take a look at the full list of talks here. A selection of video works, curated by Ali Subotnick, run continuously in the Expo Video installation. And a full-fledge exhibition titled “Chronopolitics” and featuring artists Sanford Biggers, Tom Burr, and Bethany Collins, among others, is mounted next to the main hall. Off-site, you can find public installations by Daniel Buren, Mark Di Suvero, Joel Shapiro, and Christopher Wool, to name a few. And finally, don’t forget to take note of the billboards throughout the city, which the fair has taken over as part of it’s Override project.